Who is your “Soul Sister”? Which is most true of you? I like to be in charge, out in front. Which of these qualities would you like to have more of? whose greatest strength is hidden receptivity. In her short life, she experienced the love of God even in times of great suffering and trial. Like St. Therese, your openness makes you aware of God's presence in the ordinary details of your life: in the people you meet, in beautiful thoughts, the words of Sacred Scripture, conversations with those in need, the loveliness of the natural world, and in opportunities to serve. Growing in humility, you are an inspiration to the people you welcome into your heart. However, receptive women can be vulnerable to the ugliness and pain of the world, too, so make sure to count your blessings daily and receive Holy Communion often. whose greatest strength is courageous receptivity. She heard and recorded the words of Jesus in her famous Diary, which told the whole world of the infinite mercy of God. Like Faustina, you inspire those who are drawn to your loving and confident heart. Some might take advantage, or expect you to shoulder too much of their burden. Make sure you seek refreshment in the ocean of God’s merciful and healing love. whose greatest strength is hidden sensitivity! This French foundress of the Congregation of Notre Dame in what is now Quebec spent her life educating orphan girls (“Kings Daughters”) and meeting the needs of the Native American community, and developed one of the first uncloistered Catholic religious communities. Like St. Marguerite, you are guided by an instinct that helps you to meet people where they are: in their needs, in an appreciation of their gifts, with a sense of vision for what they might become for God's greater glory, with a little encouragement. However, sensitive women can be easily hurt, so remember to rest in God's mercy at all times. whose greatest strength is courageous sensitivity. Mother Angelica’s tenaciousness and courageous sensitivity to God’s call helped her to partner strategically and to build a media empire that reaches people all over the world with the love of Christ. Like Mother Angelica, you help others to recognize and use their own gifts, and enjoy networking with others. You are guided by an instinct that helps you to meet people where they are: in their needs, in an appreciation of their gifts, with a sense of vision for what they might become for God's greater glory--with a little encouragement. Your presence uplifts others and gently challenges them to rise to your level. However, sensitive women can feel overwhelmed by their everyday burdens and emotions, so make sure to count your blessings daily and cultivate a joyful heart. whose greatest strength is courageous generosity! St. Teresa made it her life’s work to tend to the needs of the poorest of the poor, seeing in them “Jesus in distressing disguise.” Like St. Theresa, you are tireless in your efforts to help those around you, and are thankful that you have the means to help. Dying to self, you keep your eyes focused on the joy and abundance of heaven, and this makes you a leader. Be careful to discern what God is asking you to do before you rush ahead. Leave room for others to share their gifts, too! whose greatest strength is hidden generosity! 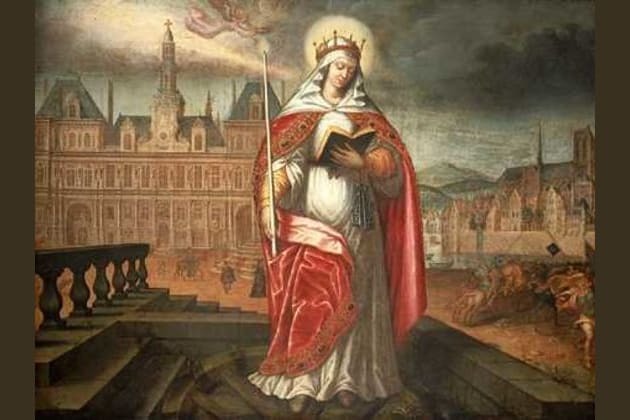 This fifth-century saint spent her life doing penance and interceding for the people of France; in 451 when the Huns attacked the city, it is claimed that her intercession turned Attila’s army away from the city. Later, she bravely saved the city from starvation by sailing to Troyes and bringing grain back for her people. Like Saint Genevieve, you give of yourself without a lot of fanfare because you know what's at stake: testifying to the love of God. You offer your time when time is short; your efforts, even when your plate is already full; your love when you yourself are in need of love. If others take advantage, call on the mercy of Christ, asking Jesus to refresh your heart and give you peace. whose greatest strength is a courageous maternal instinct! As a divorced socialite, she responded to God’s call and spent the second half of her life residing in a notorious Mexican prison, tending to the needs of the prisoners and their families! Like Mother Antonia, you are fearless in your ability to bring beauty into the lives of others in many powerful ways: acts of kindness; intercessory prayer; and providing counsel and support to others. You take joy in sharing the beauty of your spiritual insight. Pray for an increase in wisdom and trust God to provide it when you need it. And when you are feeling overwhelmed, rest in God's mercy and offer your pain for those who have wounded you. whose greatest strength is a hidden maternal instinct! Despite the tragedies that shaped her young life, including the loss of her mother when she was three, Elizabeth spent her life meeting the needs of others through small acts of faith and fidelity. Similarly, you touch the lives of others through small acts of kindness, both seen and unseen; intercessory prayer; and looking for the best in people. You take joy in bringing comfort to those who are suffering. Pray for an increase in wisdom and trust God to provide it when you need it. Avoid burnout by taking time away in prayer, and praise Jesus for the opportunity to serve him by serving others. Who is your “soul sister,” that holy woman or saint you so admire? In "True Radiance: Finding Grace in the Second Half of Life," Lisa Mladinich identifies feminine gifts and attitudes that are part of our emotional make-up, which God infuses in us to help us fulfill our God-given calling. Take this quiz to discover your strongest gift—and which holy woman, on earth or in heaven, you are most like!